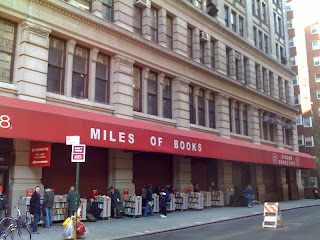 Strand Bookstore is the mother of all bookstores - 18 miles of new, used, rare, and out-of-print books on three and a half floors (spanning the entire space of the red awning shown below). It's that freakin huge and makes Barnes and Nobles and Borders look like a joke. Strand Bookstore was founded in 1927 on what was known as Book Row (the street had 48 book stores at that time and Strand was the last one standing). 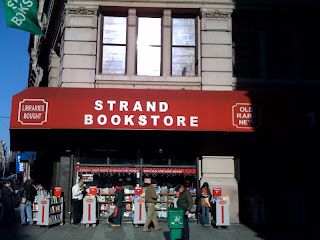 Today, the Strand remains an independent bookstore owned and operated by the founder's son. 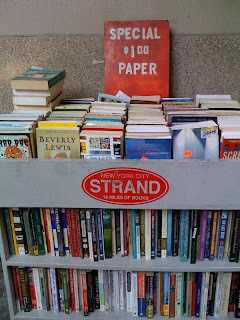 The Strand is also the world's largest used bookstore and they have the largest rare books collection in New York City, containing first and signed editions. Among Strand's rare books include a 1632 William Shakespeare Second Folio that was sold for $100,000, and hiding away in their safe is a $40,000 copy of James Joyce's Ulysses signed by Joyce and Matisse (who did the illustration). Wow! There are good book bargains here if you have the time to look. They sell new titles at 50% off cover price. And they sell $1 and $0.85 books on the sidewalks. We picked up a book on price guide for alternative records for $1. You can easily spend a whole day in this place, probably even on just one floor. We wanted to take photos inside the bookstore but there were too many employees that were playing the part of security guards. We're not mall people and thankfully we haven't come across any malls in New York City. But it's still fun browsing Christmas gifts at NYC's many boutiques and seasonal open holiday shops like this one at Union Square. 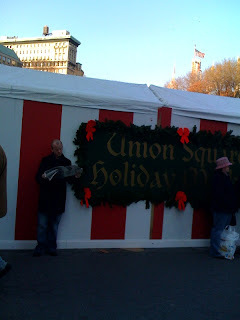 The holiday shops at Union Square featured handmade products from around the world in giant red and white striped tents. These tents took up the space where the farmers would normally set up shop during the green farmer's market. 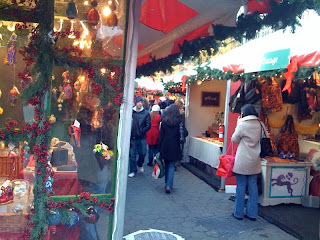 Next stop for us is the holiday shops at Bryant Park. We're thankful for many things. Our health. Our family. Our love. And last night we were also thankful for the good food at Good Stuff Diner. 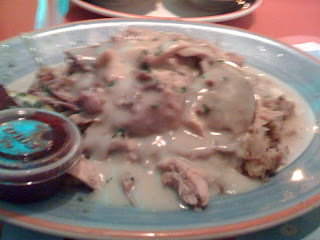 Good Stuff Diner had their Thanksgiving dinner for $21 per person where we were able to choose from their different Thanksgiving selections. Our dinner included hot apple cider, crab stuffed mushrooms, mashed potatoes, yam, turkey and stuffing, coffee and tea, and pumpkin pie. A good deal for the price and portions. I asked for only dark turkey meat and they brought me a plate of juicy, tender dark meat. 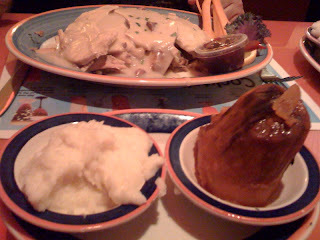 Their yam and pumpkin pie were also one of the best we've tasted ever. The food was so plentiful and we were able to bring home a container full of the leftover goods. We were in the fancy pants area (Waldorf Astoria, Bergdorf Goodman, etc.) and thought we'd have a hard time finding a place to eat lunch (that we could afford and where we wouldn't get the "you don't belong here" vibe). Bottega Del Vino looked just like the kind of place we couldn't afford and where we would most definitely get the "you don't belong here vibe." Well, we said "screw it" and went in. 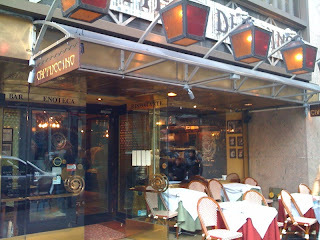 Bottega Del Vino on 7 East 59th Street is the American counterpart to its famed Verona, Italy restaurant. To preserve the essence of the original Bottega in Italy, all furniture in this restaurant was imported from Italy. 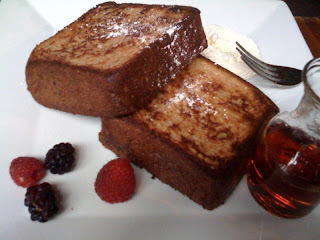 We sat in their casual dining area where lunch and breakfast are served. If they consider this casual, can you imagine what their formal dining area looks like? By the way, their restroom, which you have to take an elevator down to use, was the cleanest restaurant restroom, so clean it looked like a showroom display. 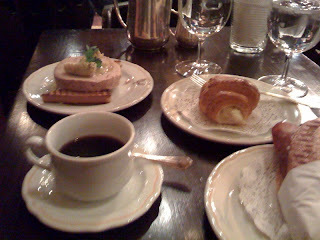 As one would expect from a restaurant like this, the presentation of the food as simple as bread and coffee was superb. We found amusement watching one of the workers meticulously cleaning the water glasses. 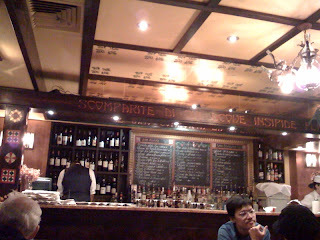 Bottega Del Vino is known for having one of the best wine cellars in New York. We didn't try any of their expensive wines, but we thoroughly enjoyed our brunch, Italian style. 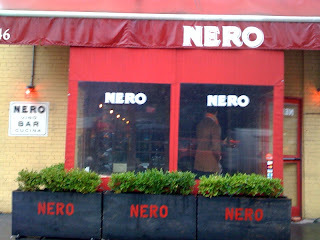 Their coffee was delicious. Their breads were wonderful. The sandwiches were both simple and refined. We ordered the Terramar, an open-faced sandwich with tuna and artichoke hearts, and this San Babila sandwich (smoked ham, brie, fontina, rucola and pate) was fantastic. We would love to go back to Bottega Del Vino because their dinner menu looks mouth-watering. Sea scallop carpaccio, warm black truffle goat cheese, grilled filet mignon with duck pate, seared monk fish medallions . . . sounds so decadent and worth a try (if we could afford it). 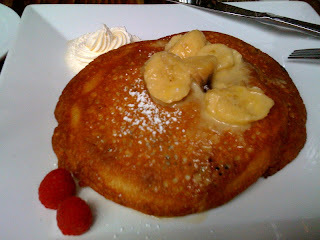 One of our favorite neighborhood coffee shops is surprisingly a Vegan coffee shop. 'Snice is a casual, laid-back coffee shop and restaurant that sells Vegan and Vegetarian food and coffee at relatively decent prices. 'Snice, which used to be one of the city's oldest hardware shops, is kind of an oddball in an area saturated with expensive designer-looking F&B places. The atmosphere is mellow and casual and the workers are friendly. There's rotating art on the walls and they tend to play a wide range of music that prompts people to talk about how bad Madonna is as a singer and the good old days of music. 'Snice actually feels more like a Seattle coffee shop than a New York one. What we love about 'Snice is it's a place where we can take a breather - meaning, after we've overindulged all week on unhealthy (yet very delicious) food, we need to pump some good greens into our body and 'Snice is a pretty darn good place to do it. 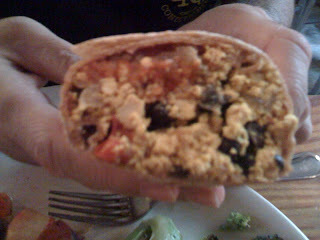 They sell healthy sandwiches, Vegan Paninis and wraps, like this tofu scramble wrap. 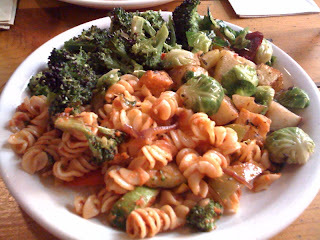 But what we love most about this place is their daily vegetarian pasta salad dishes. They are so fresh and yummy. Gotta respect a place that makes eating vegetables actually enjoyable. We were never big fans of broccoli until we met the 'Snice broccoli. They seem to have pan-fried it so the broccoli tastes a bit toasty. 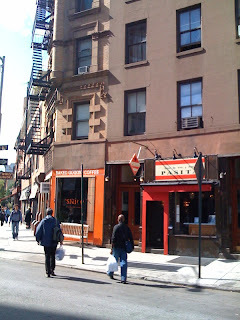 Some of their other menu items include: brie, pear & arugula with raspberry mustard sandwich; Philly-style seitan sandwich with soy cheese, peppers and onions; Tri-color panini with gorgonzola, walnuts, and apple; Thanksgiving leftovers with tofurky, brussel sprouts, roasted sweet potatoes, gravy and relish; and many more interesting vegetarian/vegan items. They also sell salads, smoothies, organic fare trade coffee, hot chocolate that consists of soy milk and vegan marshmallows, and Vegan cupcakes. Horrible name, good food, good for your health. Last night we were craving Ethiopian food. What an off-the-wall craving, right? Well, luckily in a place like NYC, you can easily satisfy your food whims as diverse as Ethiopian, Romanian, Senagalese, Polish, or Russian. We went to Meskerem Ethiopian Restaurant, one subway stop from our home. Meskerem is located in a tiny basement space with only about a dozen two-seater tables. The great thing about eating Ethopian food is the communal feel of sharing your food on a large platter, as long as those you're sharing it with washed their hands thoroughly because you eat with your hands. 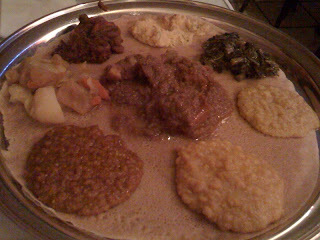 How it works is after you've made your entree selection from their beef, lamb, chicken, or vegetarian offerings, they put the food on a thin spongy bread made from an Ethiopian grain called Injera. We selected their Vegetarian combo and their lamb cubes. 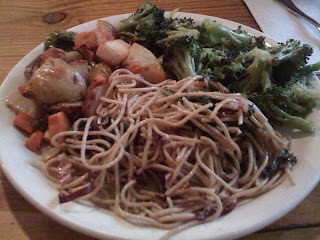 The vegetarian offerings we tried included several different types of lentil stew, another stew with chickpeas, collared greens, cabbage and potatoes. Unfortunately, the lamb cubes were too thick and hard, which didn't work well without a fork and knife. 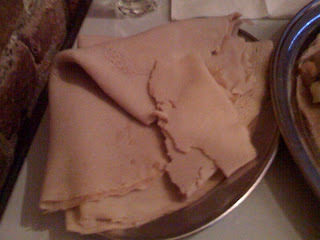 The dishes come with a separate plate of injera which you use to scoop up the food with your hands. 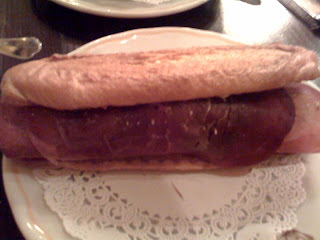 The spongy bread had a flavor like that of sourdough bread, perhaps a bit too much of the sour taste which conflicted with some of the vegetarian stews. Although this wasn't the best Ethiopian food we've tasted, it was good and very filling. It was too much food for two people but a good deal at $26 total. This restaurant is BYOB and charges a whopping $7 corkage fee, which the table near us foolishy agreed to. November is the most beautiful month of the year in New York (although December in New York is supposed to be pretty spectacular too). On Sunday we took a stroll through Central Park to take in the views of the stunning Fall trees before the leaves completely fall off. If you're planning a trip to NYC, doing it in the first three weeks of November is highly recommended. Central Park is an unbelievably beautiful park (and a whopping 843 acres). And add the red, orange, and yellow trees, and you feel so thankful to be alive. Please click on these photos to enlarge. The yellow trees were my favorite. Some were gentle, pastel yellows (it looked like there were a million yellow butterflies fluttering on the trees). . .
And others were bright canary yellow. In order to witness the full glory of the Fall trees, you have to go on a sunny day. The sun's rays made some of the trees look like gold. These photos don't capture the magnitude of the beauty and experience of walking through this wonderland. We couldn't have picked a more perfect day to have our Fall day in Central Park. It had been raining so we were scared that by the time it got sunny, the only views we would have would be on the grass. It was fun to see people tossing around the leaves. We lost track of the horse carriages through the park. There must have been at least 100 horse carriages that we saw. We would have wanted a ride through the park as well if not for its steep $40 ride for 20 minutes (not including tip). (Who knows, we might splurge during Christmas time for one of these rides). Last, but certainly not least, in our glorious day at Central Park is the Wollman Skating Rink. How beautiful is this outdoor ice skating rink in Central Park, surrounded by gorgeous trees, in the middle of skycrapers? And we did it! We went ice skating!!! Our first ice skating experience in New York City. It was so much fun!!! The ice rink was waaaay bigger than the Rockefeller rink and the views were stunning. They were also playing music (there was even a DJ booth), which actually helped ease our worries about falling. It was crowded and it made us pretty nervous every time we saw people fall or when the kids were zooming by us. Many of us adults were very wobbly. But we miraculously didn't fall once. Another great thing about Wollman Skating Rink is there is no time limit so you can skate for hours and hours (until your ankles start to hurt thanks to the painfully uncomfortable rental skates). They also sell food and beverages so in between your ice skating twirls and falls, you can have some hot dog and drink some hot apple cider. Walking through Central Park among the Crayola of trees and ice skating at Central Park is an experience we will never forget for the rest of our lives - one of our happiest days. Again, if you are ever planning a trip to NYC, do so around this time of year and go ice skating at Wollman. It is a phenomenal experience. 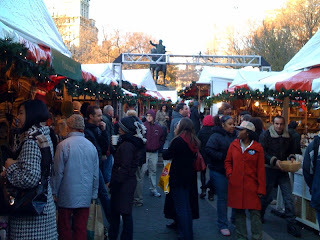 We will go back to ice skate at Wollman, as well as Bryant Park and Rockefeller after the Christmas lights go up. Another reason we are happy to have made the journey to NYC. 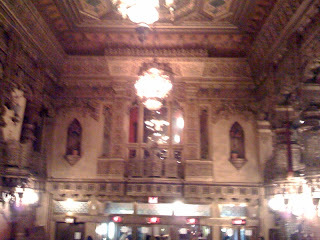 Last night we went to the Smashing Pumpkins concert at the United Palace Theater. The subway ride up to 175th Street in Washington Heights was surprisingly not as brutal as we thought it would be. 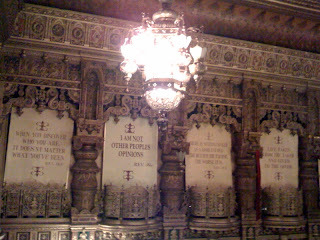 We walked into the United Palace and were in awe of the beautiful theater that looked Gothic, Victorian, and Quirky and smelled like your grandpa's closet. 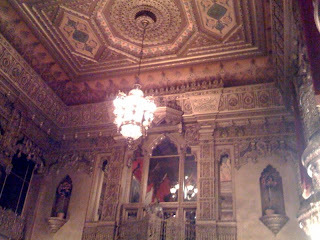 The intricate and odd designs of United Palace has been described as "Cambodian, Rococo, Neo-Classsical, Persian, Indo, Romanesque." It was made for vaudeville, is currently owned by a church, yet most often its performers are rock bands. The mix of all these elements make it an especially perfect venue for a band like Smashing Pumpkins. We liked these quotes from Rev Ike of Christ United Church: "I am not other peoples opinions" and "When you discover who you are, it doesn't matter what you've been." There were no opening acts. The concert started on time at 8:00 PM. They played a solid two and a half hours. The theater was completely packed (there were even two buddies that got stuck trying to share one seat). The crowd was definitely a Smashing Pumpkins crowd and the same kind of crowd that would probably also go to a Pearl Jam, Stone Temple Pilots, and Beastie Boys Concerts - the kind of people that grew up with these bands' music at the height of their careers and no matter how old we get, no matter how old these band members get, their music is always constant, defining a certain moment in time of our youth, adolescence or early adulthood. The Smashing Pumpkins sounded phenomenal. The stage was simple and intimate. The lighting was insane; it was an artistic show in itself and conveyed the perfect visual element for each song. 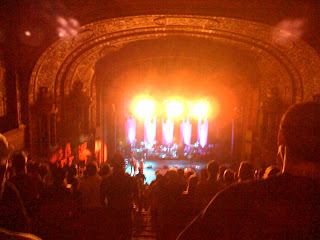 The music was classic Smashing Pumpkins - from the angst-filled hard guitar sets to the melancholy acoustic solos. They're one of the few bands that can seamlessly integrate trumpets and violins into their tortured-soul, despair-filled sounds. Some sets were painfully long. And one of the disappointments was that they didn't play a lot of our favorites. The crowd went crazy when they played their classics like "1979," "Disarm," and Corgan's beautiful acoustic version of "Landslide." One funny yet annoying moment was when someone from the crowd shouted something at Billy Corgan, which upset the sensitive rocker. Corgan called him on to the stage where the guy shouted at Corgan, "your concert sucked last night," and Corgan responded by saying, "do you want your money back?" The jerk responded "no." I'm sure most of us last night could not believe this was their 20th Anniversary concert. It'd be crazier to see them at their 40th. We waited a long time and had to travel all the way to New York City to see them live. We would have liked to hear all the songs that made us fall in love with them, but we were grateful for the night that we got to drown in their music. After all, bands like Smashing Pumpkins and musical geniuses that have a love and hate relationship with their success like Billy Corgan, are an almost extinct breed. This is chocolate from Max Brenner (dubbed Willy Wonka for adults) from Israel. And this is Kit Kat from Israel, translated to "Kiv Kat." We still love the strange and wacky Kit Kats from Japan we've tried like green tea, flan, and strawberry. 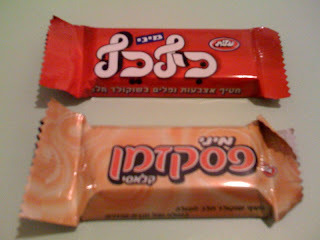 But this standard milk chocolate Kit Kat from Israel tasted better than its American counterpart. Who knew that some of the world's best chocolate is in Israel? 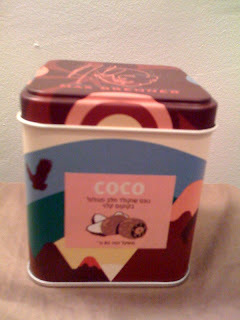 Damn good chocolate!!!! The Empire State Building glowed blue in honor of the winner. New York City went absolutely crazy last night after 11:00 PM EST when it was announced Barak Obama will be our 44th president. It was a festive night in NYC from Harlem to Rockefeller Center to Times Square to Brooklyn. Times Square looked like it was New Year's Eve and the map of the United States was the only thing on Rockefeller's ice rink. Our new president has a lot of mess to clean up, and that's an understatement. It seems the whole world has such high hopes and expectations for him. He certainly is a breath of fresh air. We can't wait until the current occupant at the White House packs his belongings and gets the hell out. Hopefully Bush won't do any more damage in his last days; someone needs to ground him. 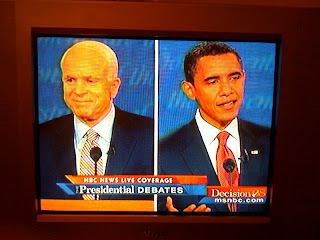 By the way, PBS's Frontline had a great show The Choice 2008 that's worth watching. We were surprised at the detest McCain had for Bush, supposedly comparing him to the tin man (because he had no heart), scarecrow (because he had no brain), and the cowardly lion (because he had no courage). 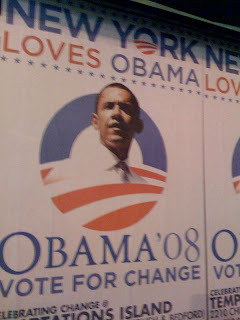 There's "New York Loves Barak Obama" posters, T-shirts, and pins everywhere. 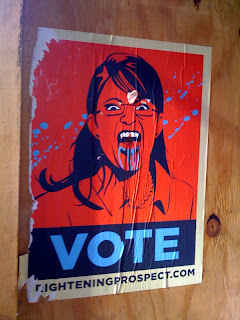 Likewise, there's also funny anti-Palin propaganda. We love this one of Sarah Palin, the blood and oil-sucking animal-shooting, eye winker. We'll be standing in a long line tomorrow because the thought of someone who doesn't know basic geography or who can't tell you what she reads becoming Vice President, or worse possibly the President, is very terrifying. A frightening prospect indeed. 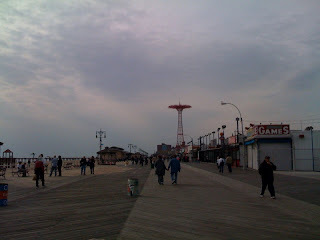 Yesterday, we thought it was the perfect day to make the trek to Coney Island located at the Southernmost area of Brooklyn, and which was once the largest amusement site in the 19th to early 20th century. The weather could not have been more perfect - sunny and cool but not cold like it's been lately. (If we went today instead, it would have been much too cold). It's something we wanted to do one time while in New York City. 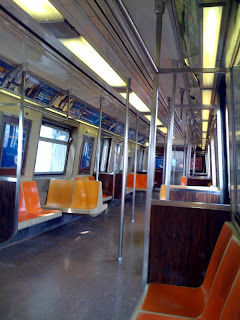 And of all the freaky things in New York City, this is one of the freakiest we've witnessed - an empty subway car. It felt kind of spooky without anyone it. It took us almost about 50 minutes and 26 stops to get to the Coney Island-Stillwell Avenue subway station (the last stop) from our house. This is definitely the farthest and longest subway ride we've taken. But things didn't turn out like we imagined. We found ourselves in a Griswold moment. Remember the scene in National Lampoon's Vacation when the Griswold family drives cross-country to go to Walley World theme park just to learn that it's closed. WHAT DO YOU MEAN YOU'RE CLOSED??!! That was us yesterday. 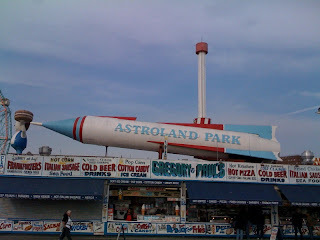 Apparently Astroland Park was closed by the family who owned and operated the historic amusement park for almost half a century because of a lease dispute. We just missed it - they closed this past September. We were really looking forward to riding the Wonder Wheel, the tallest ferris wheel in the world that opened in 1920, and has both stationary and rocking cars. But suckiest of all is that we missed the classic Cyclone roller coaster. 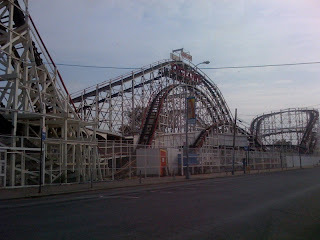 It was built in 1927 and is the oldest wooden roller coaster (in operation until recently). We were really looking forward to getting terrified by the old creaky noises. The sounds that induce one's imagination of the roller coasting falling apart would be way scarier than the dips and turns. 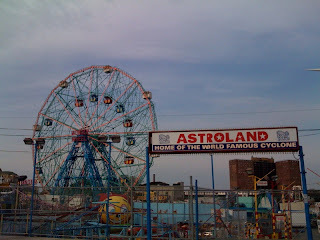 The current site of the desolate and somewhat creepy Astroland will be redeveloped and it's said they'll keep the Cyclone and Wonder Wheel. We didn't kidnap a worker to open up the amusement park to us the way Clark Griswald did. Because at least we got to have a hot dog at Nathan's Famous. This is the original location of the now Walmart-esque hot dog franchise. As their sign said, "from a hot dog to an international habit." 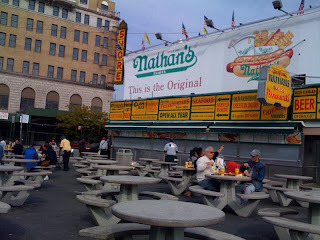 The history of Nathan's is a classic New York American immigrant story. The hot dog was supposedly invented in 1874 by Charles Feltman, whose hot dog shop once occupied the Astroland Park space, and who hired Nathan Handwerker who would later create Nathan's Famous. The lines weren't too long, but still long enough to witness hungry people fighting in line. Once you grab your dog, you can sit inside or outside. The weather was great so we ate outside. Wasn't a good idea. The area was dirty, with lots of hungry pigeons, and worst of all were the bees. If you have any allergies to bees, eat inside - this place was swarming with bees, not just regular 'ol bees, New Yorker bees, the kind that likes wieners more than honey. This is their classic hot dog that started the craze. Nathan's Famous dog was tasty. 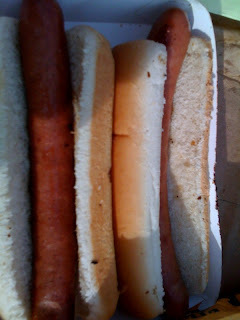 When we bit into these hot dogs, there was a crisp snap followed by a tasty filling. But we wouldn't say it's the best we tasted. This is an example of when a brand is mightier than the product. 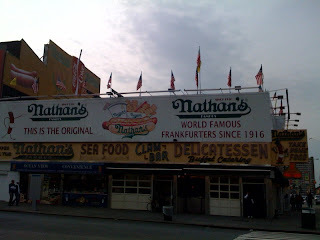 But thinking of the yesteryear when people like Al Capone, Cary Grant, and President Franklin Roosevelt all ate Nathan's hot dogs make you feel like you're tasting a part of old New York history. 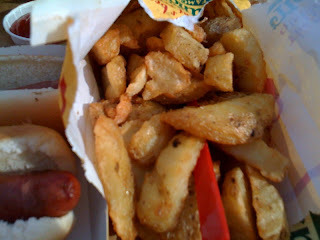 Their crinkle cut fries were definitely delicious and the perfect match to their dogs. 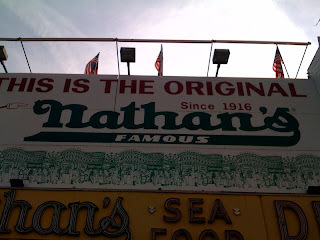 It would be fun to go back to watch (or be a contestant at) the Nathan's famous hot dot eating contest every 4th of July. 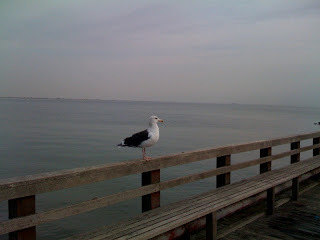 The famous Coney Island boardwalk. Everything felt so melancholy. 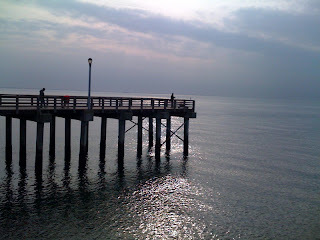 The weather was nice and it was even somewhat sunny but everything appeared so gray. The Coney Island beach was closed but families were still playing in the sand. 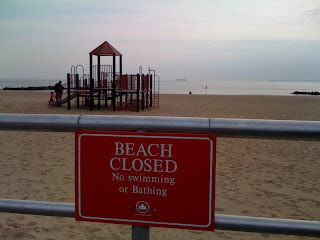 It's not winter yet so we didn't get to see the The Coney Island polar bear club, the oldest winter bathing organization in the U.S. that swim there in the winter months in the freezing waters. 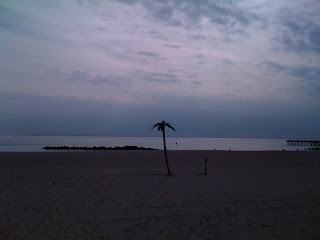 And this just added to the overall depressing atmosphere - a small fake palm tree in the middle of nowhere. 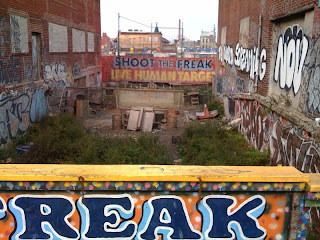 Disappointing, gloomy, depressing, dirty, gray, melancholy, and somber are words that describe the overall abandoned ghost town feel of Coney Island, although it's probably a much different experience in July. And as if that wasn't depressing enough, our subway ride back home was hell. Due to a sick passenger in the train in front of us, it took us an hour and 45 minutes to get back home.